The purpose of this chapter is to describe the various practices that address the issues and challenges associated with data collection, processing, and reporting for high traffic-volume routes. Table 3.1 aligns the issues to the practices adopted by states to overcome or mitigate them. The practices are grouped into four major categories: (A) general (the issues apply to all categories), (B) data collection equipment, (C) data collection, and (D) data processing, quality control, and quality assurance. The descriptions are based on the information gathered through the interviews of sample states and supplemented by information from the published literature. The practice areas are illustrated with examples of use by states. Additional sources of information relevant to the practices are also identified. Furthermore, additional documentation for each practice area is included on an accompanying CD. Where possible, hyperlinks to these documents are provided. The documents on the CD include traffic monitoring guidelines, HPMS field guides, contractor specifications, training materials, equipment evaluations and specifications, and data quality assessments. Improving HPMS data collection on high-volume roads is often pursued by training and providing guidelines to personnel and agencies, since high-volume routes have special requirements with regards to placement of equipment and data quality verification. Several agencies provide focused training to the staff involved in data collection and processing. Staff training was identified as an important element to ensure that good quality and reliable traffic data are collected. For example, Virginia DOT (VDOT) conducts annual program meetings, quarterly reviews, and other equipment-related training to enhance the skills and experience of the field staff and contractors. VDOT also publishes a pocket guide for conducting traffic counts, including guidance on best practices for installation and site selection (Guide to Installing Road-Tubes in Virginia [CD]). On-going training helps field personnel in selecting areas with the best characteristics needed to collect accurate traffic data. New York State DOT (NYSDOT) trains county personnel, contractors, and state personnel on traffic monitoring in an annual workshop. The workshop is open to all and serves as a valuable forum for all the parties involved with traffic monitoring in the state to meet and discuss concerns, opportunities, and emerging approaches. Maryland and Virginia have detailed specifications for short-term counts performed by a contractor, including quality levels, installation, and data collection procedures. Maryland has detailed specifications and requirements for contractors to follow, including a review of data by a professional engineer. If short-term counts are found to be in error, the agency requires contractors to recount the section. Pennsylvania DOT (PennDOT) assesses HPMS data and publishes an annual quality review report. The main objectives of the quality report are to ascertain the current state of HPMS data quality and ensure that errors found are corrected, determine if any common problems areas exist and identify training needs, and determine if any organizational or procedural changes to HPMS program are warranted. To this end, random HPMS field views of randomly selected sample sections in several counties are checked. Approximately one third of the data-collecting agencies in Pennsylvania are reviewed each year (Heltebridle, 2002). Some of the improvements attributed to the quality reviews include development of the PennDOT HPMS Data Collection Guide, HPMS conferences, yearly quarterly review reports, and invitations to MPOs and city officials to attend conferences. However, it is not clear if AADT values are checked as a part of the quality reviews. Indiana DOT (IDOT) conducted a detailed assessment and update of its traffic monitoring system to ensure that IDOT is in agreement with the new traffic-monitoring guide requirements (Labi and Fricker, 1998). The assessment focused on the management systems, the continuous counts, coverage counts, vehicle classifications, database systems, office factoring, and field procedures used by IDOT. The document also discusses the HPMS program, involvement of MPOs in traffic data collection, and traffic-monitoring activities of other states. Heltebridle, L., Pennsylvania Department of Transportation, PennDOT Quality Reviews, Presentation at HPMS Issues Workshop, Chicago, August, 2002. Agencies are trying to maximize performance of existing technologies such as axle and volume traffic counters using road tubes or inductive loops. Improving performance of these detectors is primarily achieved through a combination of installation, calibration, and maintenance practices as well as through technical improvements. The accuracy of counters declines in high-volume conditions, especially using pneumatic road tubes. The accuracy of classifiers also declines in congested or especially in stop-and-go conditions. The following are potential solutions to the problem and illustrated by examples. Make sure local practice complies with standards for installing pneumatic tubes for roadway traffic counters and classifiers (See ASTM E1957, "Standard Practice for Using Pneumatic Tubing for Roadway Traffic Counters and Classifiers"). Tests conducted by Texas Transportation Institute (TTI) on Peek ADR-6000 demonstrated that it can accurately classify vehicles in stop-and-go conditions and even when vehicles change lanes over the detectors. Washington state DOT (WSDOT) conducts coverage counts by pneumatic road tubes using Peek ADR-1000 equipment. The software includes tailgate logic to improve classification accuracy in cases where vehicles are close together and might otherwise be classified as a single vehicle (truck) instead of two cars. Florida DOT (FDOT) discourages the use of pneumatic road tubes and recommends installation of permanent sensors as part of construction projects on multilane facilities. California DOT (Caltrans) has a battery of quality checks for equipment and data. It also recommends hiring quality staff to ensure high-quality data. VDOT uses tight classification tables and requires vendors to use the same. Field personnel are experts with the equipment. Illinois DOT (ILDOT) had great success with Hi-Star Numetric sensors in collecting traffic volume and classification data on highways carrying traffic less than 75,000 AADT. These sensors are easy to install and are excellent for volume data and fairly good for vehicle classification. Pneumatic tubes are a stable technology and are the mainstay of short-term equipment in many states. States interviewed are comfortable in using this technology, while recognizing its limitations. In order to increase the efficiency of road tubes, states require staff and contractors to select appropriate locations to minimize some common problems (e.g., stop-and-go traffic, parking on road tubes, pavement surface deterioration), secure the tubes to the roadway, and check the settings on the counter. The use of high-quality surge suppressors and adequate equipment ground on-site minimizes the risk of damage to pneumatic road tubes due to lightening. Also, the use of gas-discharge tubes for primary protection of phone lines. In order to reduce the risk of premature loop failure due to pavement rutting or other pavement factors, avoid the use of inductive loops in thin pavements (less than 4 inches thick) or in pavements that need rehabilitation. Their installation in such pavements will often induce even more problems. Improve pavement maintenance and use deeper saw cuts to allow milling as needed. The use of high quality loop detector wire with a thick PE or PVC tube such as IMSA Spec 51-5 and twist loop lead-in wire at least 6 turns per foot to reduce cross talk is recommended. VDOT provides a Pocket Guide ("Guide to Installing Road-Tubes in Virginia") [CD] to their field staff to aid in road-tube installation. The guide provides guidance on installation techniques based on traffic conditions and some general best practices. As such, VDOT routinely uses methods like "blocker" and "independent arrays" to separate the vehicle actuations in adjacent lanes in order to successfully gather traffic data in high-volume routes using pneumatic tubes. 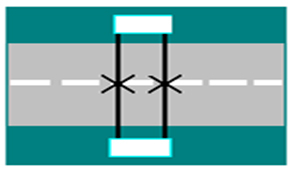 An example installation of an independent array using two tubes, two traffic counters, and blockers in the middle of the lane is shown in Figure 3.1. Further details can be found in, Lane Array and Road Tube Best Practice Guidelines, (VDOT, 2002). In Ohio, data collection crews are instructed to review data prior to submitting to central office for processing. The crew is instructed to check for high volume, multiple hours of zeros, and to reset the counters if necessary. The existing count contract includes a reset clause. When Ohio DOT (ODOT) determines that there is an error with the count, the contractor is required to make a reset. If reset is within a given range of the original count, ODOT pays the contractor for the two counts. If a difference in the count is significant, ODOT pays for one count. All new equipment is tested for accuracy and calibrated before installation. ODOT is currently initiating a research project to create a piezo-weigh-in-motion (WIM) bench tester. Michigan DOT (MDOT) tests short-count equipment set-up for accuracy prior to data collection. ATR data are downloaded daily and reviewed in week-long chunks. Any abnormalities in the data are identified by the reviewer, and the maintenance staff is sent to check the device. In addition, ATRs are also polled daily to test for communication problems. MDOT tries to schedule counts either before or after construction when possible during the traffic-counting season (Mid-April to Mid November). Caltrans inspects ATRs only if unable to poll the ATR or if the data are erroneous. However, extreme care is taken in installation and calibration. Extensive calibration is performed before accepting any new equipment. In Virginia, trained operators check equipment for accuracy during the initial setup operation in all cases. All equipment currently in use has a visual display with real-time results. Each new count setup requires an evaluation of performance before continuing on to the next count. Road-tubes are checked before each setup and replaced as needed. Advanced loop logic functions provide information when piezo-sensors begin to fail so that preventive maintenance can be planned. Equipment performance is continuously reviewed, and hardware and firmware upgrades are added as needed. In-house software is used to examine all data collected to determine the performance of equipment and sensors. New rules and parameters are added to the review process as needed. Any performance issues are addressed by making calibration changes to the detectors setup. Any changes in performance are addressed immediately. Locations with extreme stop and- go traffic are avoided. Georgia DOT (GDOT) randomly tests ATRs for accuracy using video logs that are then compared to the collected data. GDOT has a tolerance level of 5 percent variance from the ground truth and only equipment that meets this threshold is used. Adjustment factors for AADTs can be estimated better if ATRs are accurate and installed properly. For short-term counts, historical trend analysis is used with a tolerance level. GDOT also requires crews to report on conditions in the field, including changes from the previous count cycle. New Jersey regularly recalibrates WIM sensors. Regular crack sealing is done at piezoelectric axle sensors. Most service involves the communication link, such as resetting or reprogramming modems, replacing surge suppressors, or cleaning the cabinet interior. Occasionally, unexplained problems require replacing circuit boards or the equipment (e.g., communication boards, loop detector boards, or other ancillary boards). Massachusetts reported that equipment is checked on an ongoing basis, performing testing throughout the year. The DOT emphasizes operational instructions to field staff on a continuous basis. Staff are required to wait after equipment is installed to ensure it is working before leaving the site, and to check if it is still working accurately before shutting it off and picking it up at the conclusion of the count. Maryland uses two road-tube-based products from Progressive Engineering Technologies (i.e., PET Switch, Road Ramp) for traffic monitoring on high-volume roads. The PET Switch System uses an intelligent road tube that is configured to distinguish between lanes and allows the collection of speed, axle classification, and volume data simultaneously in up to four lanes. RoadRamp, a portable axle-sensing system with a separate axle sensor in each lane, guarantees more accurate lane classification and reliable traffic counts on busy, multi-lane sites. VDOT has specified that all traffic-counting equipment include a visual display component that enables the field personnel to check visually if the equipment is set-up, calibrated, and working correctly. VDOT also works closely with vendors to develop a tight classification table and requires vendors to use this table for their classification algorithms. Any vehicle that registers as an unclassifiable (Class 15) will be reported back to the center and reviewed. VDOT also works with the vendors (e.g., PEEK) to develop a tailgating logic especially for high-volume roads with close headways to better classify vehicles (e.g., determining whether four counted axles represent two cars or one truck). VDOT uses in-house software to cross check set-up parameters in counters to ensure that manufacturers correctly code in the required information. NYSDOT has specifications describing the requirements for portable microprocessor based ATR to be furnished to NYSDOT, and other governmental units within New York State for use with loop-piezo-based sensors. Technical requirements include construction, materials, hardware, software, environment, vehicle detection, and operations. One of the breakthroughs, which enhance vehicle detector output by utilizing inductive loop signatures, is now available in the Peek ADR-6000. The software enhancement techniques involve several algorithms designed for use in roadside vehicle detection equipment and which may apply to vehicle classification, toll applications, and incident detection. Recent tests by the TTI indicated that the Peek ADR-6000 was very accurate as a classifier, counter, and speed detection device and as a generator of simultaneous contact closure output. However, its recent introduction into the U.S. market and being adapted from a toll application are factors in its need for further refinement. The classification result for a data set of 1,923 vehicles indicated only 21 errors and resulted in a classification accuracy of 99 percent (ignoring Class 2 and 3 discrepancies). This data sample occurred during a peak period and included some stop-and-go traffic. For count accuracy, the Peek in this same data set only missed one vehicle (it accurately accounts for vehicles changing lanes) (Middleton and Parker, 2002). NYSDOT, Highway Data Services Bureau, Loop/Piezo Automatic Traffic Recorder Specification, September 2001. Non-intrusive sensors require less exposure of workers to traffic hazards and are sufficiently accurate for traffic volume monitoring applications except in very congested and stop and go conditions. The use of non-intrusive data collection equipment for traffic data collection has been investigated by various states primarily to realize two major advantages: relative ease of installation and improved safety of traffic personnel. Non-intrusive traffic detection technologies include infrared-, microwave-, laser-, acoustic-, and video-based sensors. While some of the states are experimenting and testing some types of non-intrusive equipment, other states are now beginning to review that option. The following sections summarize state practices and experiences with non-intrusive equipment. ODOT uses Electronic Integrated Systems (EIS) Remote Traffic Microwave Sensor RTMS (http://www.rtms-by-eis.com) units in five locations to collect traffic volume data. ODOT has also tested video (Autoscope) and acoustic sensors. ODOT observes that the main disadvantages are that set-up is difficult and that RTMS only reports two vehicle classifications: long vehicles (trucks) and all others. VDOT is actively researching several non-intrusive technology devices. To date, only the RTMS sidefire radar has been approved for use. It can be used as a portable detector and has the required accuracy. VDOT has reviewed other non-intrusive products but none has met their current needs. Caltrans tested RTMS extensively but did not obtain favorable results, citing long set-up times and occlusion problems. Caltrans recognizes that these technologies have improved since and has developed guidelines/requirements for non-intrusive detectors. The draft guidelines are intended to help California personnel to make an educated estimate of whether microwave sensors can fulfill their requirements. The document contains checklists of requirements that must be met, test results of various microwave models, technology descriptions, and installation overviews. The Detector Evaluation and Testing Team (DETT) of the California Department of Transportation has recently tested two non-intrusive detectors, RTMS and Wavetronix SmartSensor. Results indicate that overall count accuracy was almost always within 95 percent of true counts and within 98 percent on some lanes. Speeds were also within 95 percent. One difference between the Wavetronix and the RTMS X3 detectors was the difficulty of setup and calibration. The Wavetronix only required 15 to 20 minutes total to set up, whereas the factory representative took about one hour per lane for the RTMS (Middleton et al., 2004). ILDOT is a strong proponent of length-based classification and has worked with FHWA to report length-based classification for HPMS. The use of length-based classifications encourages the use of non-intrusive detectors. Often the inability of such devices to classify vehicles into 13 vehicle categories is mentioned as a major impediment to their increased use. ILDOT tested various non-intrusive equipment including microwave and acoustic sensors. NYSDOT tested 3M Microloops for bridge deck applications. NYSDOT also tested SAS-1 acoustic sensors for their low-power requirements and low cost advantages. The main advantage stated by New York is the safety of traffic personnel. The Traffic Monitoring Unit of the NYSDOT has successfully developed a permanent acoustic traffic monitoring site. This site was developed in-house to support nonintrusive sensor technology with applications in data collection and ITS activities. Further details are presented in Chapter 4 of this report. In addition to using the acoustic sensors as permanent stations, NYSDOT also has four mobile platforms equipped with the sensor for portable counts including coverage counts, special counts, and some ITS design applications. Each is used to collect volume data on high-speed, high-volume, multi-lane facilities where typical collection methods cannot be used due to safety concerns or equipment limitations. Peek-Vision pole-mounted video data collection was installed. Institutional considerations required the mounting to be roadside rather than in the median. Pole height was limited by available service equipment. Communication was via land line rather than the fiber-optic network originally planned. Staff constraints precluded sufficient evaluation or implementation. 3M Microloop system was installed and operated satisfactorily. The Detector/ Recorder system could not be set to record data on the hour; it was always plus or minus several minutes although 60-minute intervals could be recorded. Initially, there seemed to be interference from nearby power lines. The manufacturer adjusted the system's frequency to alleviate the problem. Staff constraints precluded followup with the manufacturer to rectify the recording time or further implementation. Although RTMS sensors have been installed as part of ITS incident management initiatives, NJDOT does not use count data from these sensors yet. The New Jersey Highway Authority tested an acoustic detector. NJDOT was never advised of the results. The Vehicle Detection Clearinghouse, a multi-state, pooled-fund project managed by the Southwest Technology Development Institute (SWTDI) at New Mexico State University (NMSU) and sponsored in cooperation with the U.S. DOT FHWA, is a valuable resource for o documentation about technology, evaluation and testing results, and details on use of technologies by states. On the Internet, the clearinghouse is located at www.nmsu.edu/~traffic. New York State Department of Transportation, Permanent and Mobile Platform Acoustic Site Summaries. A primary concern in the monitoring of high-volume routes is the safety of data collection crews. Various states have developed strategies/guidelines to ensure safety of the agency personnel and the traveling public. Some of the strategies include setting of safety zones, training, and guidelines for field personnel. Washington State identified different zones for data collection. These zones were not identified strictly based on traffic volume but a combination of traffic and roadway characteristics (Figure 3.2). All traffic-count personnel must be provided a minimum of two weeks of training by accompanying an experienced field technician who is collecting traffic data. All personnel must be provided training in first-aid techniques and be familiar with safety procedures before they are allowed in the field. Seat belts shall be worn during operation of vehicles. Orange safety vests and UL-approved safety glasses or safety prescription glasses shall be worn during field operations. Reflective safety vests shall be worn during low-visibility situations. Turn signal and yellow roof mounted strobe lights shall be activated as the traffic count vehicle approaches the work site, usually five hundred to one thousand feet (500' – 1000') in advance of the site. Four-way flashers shall be activated at the work site and the flashers and strobe lights shall remain activated until the proper turn signal is activated to leave the work site. Strobe lights shall be turned off after the vehicle safely re-enters traffic flow. All traffic count personnel shall conform to Occupational Safety and Health Administration (OSHA) Rules & Regulations. vehicles shall be parked where there is adequate space to park the vehicle safely. The vehicle should be parked a minimum of four feet from the edge of the pavement. All traffic count personnel shall exercise extreme caution when entering the roadway to set or retrieve traffic sensors. Under no circumstances shall traffic sensors be placed in the roadway when it is raining or foggy. All traffic count personnel have the right to request that their supervisor assign additional help to assist them if they deem there is a need for a two-person crew to set equipment safely. Night work should be done only when traffic flow dictates it to be necessary, and then only with two or more technicians. One person should spot while the other is working near the pavement. Reflective vests must be worn at all times when working at night. These procedures are also reinforced through a video about safety included in the handbook. New Jersey emphasizes installation safety on high-volume roads. The necessity of obtaining vehicle-type classification data by visual/manual methods rather than automatic vehicle classification (AVC) technology also requires special emphasis on safety for high-volume roads. Special consideration is usually given to volumes over 15,000 per lane per day. Typically classification using AVCs is not undertaken where more than one lane cannot be monitored by one machine. Also, if the state or the contractor determines that lane closures are needed to safely install and remove traffic monitoring sensors, the contractor is required to submit a "request for police assistance" to the appropriate state police coordinator and procure the services of a New Jersey DOT-approved Maintenance and Protection of Traffic contractor. According to ILDOT, data collection staff cannot safely install data collection equipment on high-volume roads (AADT greater than 70,000). Road segments with traffic volumes greater than 100,000 AADT are in the Chicago area. In these areas traffic data are collected with loops and at toll way facilities by the toll way authorities and Chicago Area Transportation Study (CATS). When it is determined that a road carries sufficiently high traffic volume to preclude the safe installation of data collection equipment, manual count is used. However, manual counts are not a recommended practice because it noted to be expensive and could potentially suffer from accuracy and reliability problems. Similarly, Texas and New Jersey also perform manual classification counts where it is not possible to install traffic data collection equipment either because of safety considerations or because of equipment limitations. Massachusetts employs safety procedures to protect DOT staff and the general public. Installation of inductive loops on high-volume routes are coordinated with pavement construction and maintenance programs. Florida Department of Transportation, Transportation Statistics Office, Traffic Monitoring Handbook, October 2002. Florida Department of Transportation, Safety Video for Field Personnel, included in Traffic Monitoring Handbook, October 2002. Ramp balancing using counts on on/off ramps combined with control counts on the main line are used in locations with high traffic volumes where it is not possible to conduct mainline counts safely. The TMG defines ramp counting as the process of counting traffic volumes on all entrance/exit ramps between two established mainline counters, such as permanent ATRs or other installations, and then reconciling the count data to estimate mainline AADT. A limitation of the ramp-counting approach to estimate mainline volume is that, travel-lane volumes cannot be estimated because traffic entering the road cannot be allocated to lanes. This limitation is not a concern for data collected to meet the specifications of the HPMS, but it may have implications for other programs that depend on lane-specific traffic volume information. California, Florida, Georgia, Michigan, Ohio, Texas, and Washington use ramp-balancing approaches that were developed based on the guidelines and recommendations of the TMG. California uses ramp balancing extensively on high-volume roads where there are no permanent counters and crew cannot safely install portable counters. Caltrans has an Excel spreadsheet that contains formulae to calculate AADT volumes based on daily ramp counts. Instructions to complete the worksheet are also provided to the field staff and are shown in Figure 3.3. MDOT uses a ramp-counting program in S.E. Michigan (Detroit area). State personnel count at ramp entry and exit locations instead of counting mainline segments. These are then used in combination with the ITS detectors and the loops on the mainline to obtain the AADTs for the segments between two entry and access points. The ramp-counting program is conducted according to the TMG guidelines. Georgia DOT was one of the first state agencies to use step-down (ramp balancing) approaches to counting traffic on mainlines of limited access highways. In Texas a database system (STARS) is expected to automate the ramp-balancing process. The ramp-balancing programs are being set up based on the TMG guidelines. Washington DOT calculates adjustment factors differently for the ramp balancing and has a quality check of less than five percent variation from the control points and estimated counts as recommended by TMG guidelines. U.S. Department of Transportation, Office of Policy, Traffic Monitoring Guide, 2001 Section 3, Chapter 4. Freeway ramp balancing is performed to calculate mainline Annual Average Daily Traffic (AADT) between 2 control stations. This process also calculates Ramp AADTs. The latest LRI/MADT and daily reports for ramps will be needed. The following are instructions for filling out the Freeway ramp balancing computation worksheet: The instruction number corresponds to the number identified on the sheet. Enter beginning Control Station AADT. This number is posted on the LRI/MADT report. It is critical for this number to be accurate, therefore the control station must be free of erroneous data. Enter ending Control Station AADT. This number is posted on the LRI/MADT report. It is critical for this number to be accurate, therefore the control station must be free of erroneous data. Calculate adjustment ratio, formula outlined on worksheet. The adjustment ratio is multiplied to each ramp volume. Post result of instruction 12. Calculate adjusted (AADT) ramp volume. If the adjustment ratio, calculated in instruction 11 is positive ADD adjustment to all NB or EB off and SB or WB on ramps; i.e. all Back Ramps and SUBTRACT adjustment from NB or EB on ramps and SB or WB off ramps; i.e. all Ahead Ramps. Calculate mainline AADT. Starting with Beginning Control Station AADT subtract Back Ramps and add Ahead Ramps. Repeat process for each interchange using the calculated AADT for subtracting and adding. Do the necessary rounding and post to AADT turnaround document. The adjusted ramp volume is posted in TSN. All ramps must be accounted for. If a ramp is not counted you can either estimate the volume or use the last count. If the last count was already adjusted post it in the adjusted column. Source: Joe Avis, Caltrans, "Ramp Balancing Process, Computational Spreadsheet." A noticeable trend in traffic monitoring is contracting data collection activities to private contractors or other agencies. Under such arrangements, private contractors are responsible for data collection activities, with the DOT playing a supervisory role. Performance criteria is increasingly becoming popular with state DOTs as a means of ensuring data quality from the contractors. There also has been an increased interest in using county and local personnel in traffic-counting programs by providing county and local agencies equipment and training to collect and report data to the state DOTs. Maryland State Highway Administration (MDSHA) contracts traffic data collection. SHA provides the specifications and data collection templates for the contractors on their websites. VDOT's Mobility Management Section (traditional data collection) leases its traffic counters and modems from Digital Traffic Systems (DTS). However, VDOT owns the sensors such as inductive loops and piezoelectric sensors. Since 1996, VDOT has contracted the data collection activity and leased data collection equipment. The current maintenance agreement with DTS is carefully written to assign responsibilities and minimize "finger pointing." There are cases where difficulties might otherwise arise, such as with traffic counters that did not work due to faulty piezoelectric sensors. A state inspector checks the equipment once a year, but if there are substantial errors in the data, the contractor has to re-collect the data (Fekpe et al. 2003). There will be full payment for all Automatic Traffic Recorders (ATRs) and modems at sites with 25 or more days of useable classification and volume data (for factor creation) during a calendar month. There will be 75 percent payment for 15 or more days and lesser payment for fewer days of acceptable data except that monthly payment will not be made for sites that have fewer than 15 days of volume data only available during a calendar month. For service calls for maintenance purposes, the contractor will not be reimbursed a separate charge (pay item) for the service calls related to ATR/modem equipment problems, telephone line problems, or failed sensors, as costs associated with the service calls are included in the price of the monthly lease charge. The contractor is given seven calendar days to investigate, make site visits, make repairs and respond back to VDOT after notification/receipt of a service call. ODOT's Office of Technical Services, Traffic Monitoring Section, is considering the use of task-order maintenance contracts. In the past, ODOT has used small personnel service contracts to maintain pavement sensors. Now, ODOT is in the process of executing a task-order-type contract for maintenance to have contractors on board for anticipated and unanticipated maintenance requirements of the traditional data collection equipment statewide. The contract is expected to begin in the near future and will cover a time period of two years. ODOT is issuing a task-order-type maintenance contract to repair equipment including loops, piezo-sensors, and WIM sites. Other states also have expressed interest in task-order-based maintenance contracts including Texas, Florida, and Maryland (Fekpe et al. 2003). California is considering partnering with MPOs for data collection activities. The partnership would entail MPOs conducting traffic counts with their contractors and providing the data to Caltrans. NYSDOT has a formal practice to obtain data from counties. Counties are loaned equipment by NYSDOT and required to provide 10 counts per counter to the state DOT annually as part of the program. Joining the program is voluntary for the counties. NYSDOT provides training to county personnel in the use of traffic counters, and the reporting and processing systems. The county personnel are also invited to the regional traffic monitoring workshops organized by NYSDOT. It was also noted the Pennsylvania also has used county agencies extensively for data collection. Similarly, the Delaware Valley Regional Planning Commission, the MPO for the Philadelphia region, collects traffic data in four New Jersey counties for NJDOT. Maryland State Highway Administration, Specification for Consulting Services for the collection of Manual Traffic and Portable Machine Counts and On-Site Traffic Engineering and Highway Engineering Assistance, 09/2004. New York State Department of Transportation, Highway Data Services Bureau, Zone 3 contractor specifications, June 15 2003. The use of ITS data for traffic operation applications has the advantages of non-intrusion, continuous counts, and wider coverage. It also minimizes safety concerns associated with data collection on high-volume routes. Traffic data from ITS sources is of great interest to traffic monitoring programs and HPMS in particular. As stated earlier, the bulk of HPMS volume data is from short counts of 24 to 48 hours in duration. ITS sensors, while still not capable of serving as permanent counters, can efficiently provide at least a day's or two worth of data. In all, 70 percent of the States have ITS traffic detectors available and almost one-half of these States are currently using some of them for HPMS reporting purposes. One-third of these States are using some ITS traffic detectors to supply HPMS traffic data. Several noted that the number of ITS detectors available was currently limited but was expected to increase in the future. Other answers were that the data quality was poor or that it is still under consideration. Thirty percent of these States currently have no ITS traffic detectors. Several said they were willing to use them or expected to have them in the future. On the question of whether ITS data can be used for AADT reporting, most states responded with a "qualified" yes except New Jersey, which said no. The three main concerns with the use of ITS-generated data are (i) validation of data, (ii) requirements of 24-hour continuous hourly data on all lanes, and (iii) vehicle classification data. Caltrans is in the process of developing sensor-sharing technology to use the existing infrastructure of loops, cabinets and power supplies to collect planning data. Caltrans developed a "detector isolation assembly (DIA)" device that could provide total isolation between the traffic recording and the traffic control functions. The DIA device is housed in the same cabinet as the traffic controller and senses the electronic switch closure produced by the detector and passes the signal to the traffic recorder. This technology offers great potential for using existing infrastructure to obtain planning data and is of immediate use at high-volume locations with traffic controllers and ITS detectors (Triplett & Avis, 2002). California does not use ITS data yet for HPMS reporting. However, the state DOT counting program has about 219 locations where detector infrastructure on signals and ramps are shared. Ohio DOT, working on the same principle of detector sharing, uses loops currently not used for operational analysis by the ITS groups for its traffic data collection. Caltrans has a Performance Measurement System (PeMS) for the inductive loops in California. PeMS obtains 30-second loop detector data in real time from each Caltrans District Transportation Management Center (TMC). The data are transferred through the Caltrans wide area network (WAN) to which all districts are connected. Users can access PeMS over the Internet through a Web browser. The PeMS software architecture is modular and open. It uses commercial-off-the-shelf products for communication and computation. Caltrans is working with the PeMS project team to enable transfer/sharing of data between the PeMS databases and the state highway counting program. The PeMS project team will aim to provide loop detector data aggregated at one-hour intervals in TMG format. The use of PeMS data will provide the state highway traffic-counting HPMS AADT for program with a wealth of detectors that can function either as permanent detectors or control points. Data sharing and use of PeMS data are currently being considered, and it is expected that the full potential of PeMS to state highway traffic monitoring will be realized in a few years. ODOT uses ITS data from ARTIMIS that provides the data in TMG format to ODOT. ODOT also gets information from certain unused loops installed by Columbus TMC by obtaining loop outputs for a period of time using a contact closure card. ODOT installed 44 new Roadway Weather Information Systems (RWIS) that will collect traffic data in TMG format and provide real-time weather information. ITS data from Detroit freeways are extensively used for AADT reporting in Michigan. Michigan ITS (MITS) is responsible for collecting and summarizing traffic data into hourly intervals. The data are provided to MDOT once a month. MITS is responsible for the quality checks on the raw data. This is a relationship that has grown and been in place for the past 12 years. The ITS data also provide more control points to the ramp counting program. FDOT has conducted research to utilize archived ITS data for HPMS and transportation planning purposes. The project is completed in District 5 (I-4 in the Orlando area). FDOT has developed a software system to mine ITS data from the I-4 region in Orlando. The software is used to convert the data obtained from TMC to a format usable by the quality control software (Survey Processing Software). The plan is to expand it to other TMCs. Coordination between various agencies is essential for this to succeed. FDOT indicated that as a first step, data from ITS sources have to be available in an archive. There should be an emphasis to collect data from all lanes of traffic. Metadata, including the use of active/inactive/malfunctioning tags, sample sizes, and editing procedures used, are very helpful in making ITS data more useful to planning and traditional traffic monitoring groups. TxDOT is exploring the use of ITS data from their loops in Houston (TranStar) and Dallas. Various options, formats, and institutional arrangements are being considered. TxDOT does not want data from all detectors from the ITS groups but strategic locations would be very valuable. WSDOT uses ITS data in the Northwest (Seattle) region and plans to use data from new detectors for a TMC in Spokane. VDOT does not currently use ITS data sources but are progressing toward use for HPMS reporting. The ITS TMCs are beginning to report the data to a central archive (Smartravel Lab) and ongoing research is directed at using the data for various purposes. Data processing to assess accuracy, completeness, and validity of traffic data from continuous count stations is carried out using either in-house software packages or legacy mainframe programs. Typically, a software package is used to flag potentially erroneous data for further review. Similarly, data from short-term counts are processed with in-house software packages or one supplied with the equipment. Data validity and completeness are checked using a combination of business rules and criteria. All states interviewed use software to flag potentially erroneous data for further review by DOT personnel who have extensive local knowledge and experience. Most of the states DOTs interviewed do not use data processing software to process short-term count data except in cases where vendor-provided software is used to download data from the device. Some states have in-house software packages to process short-count data (e.g., Florida uses a software product called "Survey Processing Software"; Washington State uses an in-house program; New Jersey uses TRADAS, a commercially available system and legacy mainframe software that was developed in-house). Several states are in the process of developing a comprehensive database system to store, process, and query all their traffic data. These database systems are also expected to have rigorous quality control and assessment procedures. For example, Texas is developing the Statewide Traffic and Recording System (STARS), Ohio is developing Traffic Keeper-Ohio (TKO), and Georgia is updating their QC/QA system. California is already using a relational database system called the Transportation Systems Network (TSN). All states interviewed use validity criteria or data processing rules to assess the quality of the data. Data processing rules used by the states interviewed are based on AASHTO and TMG guidelines and included range checks, completeness of data, and lane-distribution splits. Figure 3.4 below is an example of the checklist for editing traffic counts in California. Hourly percent distributions by direction – are peaks where they should be. Zero volume for an hour – is it common. Virginia uses a detailed quality assessment procedure that includes six different categories of quality as shown in Figure 3.5. Data from ATRs are processed and determined to fit into six quality groups ranging from data not acceptable to VDOT to data acceptable for all purposes. Some error messages from the automated count processing system used to process data at VDOT are also shown in Figure 3.5.
ounter Set Non Existent or Redundant for Count Period. More than one direction (1, 7) is assigned to lane 1. 96 Raw Data Records are outside of Counter Definition Specifications. 9051 Vehicles recorded in a direction other than Primary and Secondary. Expected data from 2 Counters, found 1; Data Set is Incomplete. Counter Number 1 Lane Number 4 is not complete. Total Day Count for all lanes combined is Zero. No Data Found for Counter Number 1, Lane 3. Units of Axle or Vehicle not available for some or all of this count data. Counter Number 1 class table name VDOT0901 is invalid. Maximum elapsed zero time for any lane is 4.00 Hours. Percent Unclassified Vehicles (11) is greater than 10.00% for Counter Number 2, Lane 1. Total Percent Unclassified Vehicles (7) is greater than 5.00%. Total Percent Double Trailers (3.37) is greater than 2.00% on this NHS highway. Lane Total Percent Class 8 (37.01) is greater than 5.00 % for Counter Number 1, Lane 3. ADT for 2001 was 15000; This Daily Count Total: 12182. Preliminary AADT estimate of 18007 based on this count of 17625 is 93% of the 2000 A Quality ADT (19392). Raw Data Sensor Layout does not agree with Counter Sensor Type for Counter Number 1, Lane 2. Florida Department of Transportation, Survey Processing Software (SPS) User Manual, June 2001. Adjustment factors are used to convert short-term volume counts to AADT. These factors include seasonal factors which account for daily, monthly, weekly variations in data; axle correction factors use when axles instead of vehicles are counted; and growth factors when counts are not available. Most states interviewed indicated that estimating these adjustment factors are based on the recommendations of the TMG. Some states have detailed documentation of the methods used to calculate these factors. It was observed what while adjustment factors were calculated based on factor groups, these groups were mostly determined by functional classifications rather than by traffic volumes. There is no difference in the procedures for calculating the adjustment factors based on traffic volumes. ODOT uses a total of 84 factors (12 months * 7 days) which are generated using 3 year rolling averages from ATRs for each functional class. These factors are calculated using a mainframe program. These are updated yearly. TxDOT uses seasonal factors from ATRs and truck factors from classification stations. 12-month rolling summaries are used to generate adjustment factors. TxDOT plans to move towards calendar year based averages. California has a slightly different approach to adjustment factor calculation. During any 12-month period there are consistent variations in traffic volume by month, day, and hour. The changes that may occur in this consistent pattern for a specific count location are attributable to normal growth in traffic volume and random incidents affecting the site. Given these consistent variations, factors can be developed for any day of the week, month of the year, and season fluctuation to be used in estimating AADT. These factors are defined below7. Where: N = the number of months counted. 7-day counts are taken for 4, 8, or 12 months on a symmetrical basis in a year. A= Annual average daily traffic. R = 7-day R factor. These factors are recomputed every year. The station AADT is then calculated by dividing Profile Count Volumes (counts for which one day of complete data is available) by the average L factor for back and ahead traffic stations (ATRs) for the same day of week, plus average R factor for back and ahead ATRs for the same day of week, multiplied by the incremental regional factor, I, for back traffic station. WsDOT has developed a short count Factoring Guide [CD] document available from the WsDOT website. The document contains information on the sensors used, the types of counts and the adjustment factors used. Adjustment factors are updated every year. A preliminary factor is applied to short term counts during the year and re-factored based on data from ATRs at the end of the year. The Factoring Guide discusses how WsDOT calculates and applies seasonal, day of week, and axle-correction factors. It does not discuss the fact that WsDOT creates expansion factors for application to manual count traffic data in order to estimate daily traffic from manual counts (which are conducted for less that 24 hours). These factors are based on short-duration classification count and annual traffic report data. Michigan calculates adjustment factors from 2 year rolling averages of Permanent Traffic Recorders (PTR) data. Factors are calculated for 3 patterns of traffic (Urban to Recreational). These factors are calculated and adjusted every year. ILDOT uses a 4-year rolling average from ATR counts for seasonal factors (monthly factors) calculated from ATR data for five categories – urban interstate, urban noninterstate, rural non-interstate and recreational roads. No Day-of-Week (DOW) factor is used as IDOT schedules only 24 hour counts on a weekday and does not count on weekend and holidays. The Chicago area does not have different adjustment factors as of date but IDOT is working towards developing a new set of factors for the Chicago area. To this end, IDOT has added 38 new ATRs in the Chicago region between 1998 and 2000. Virginia uses ATRs to determine the adjustment factors (7 days (DOW) × 12 months). The factors are computed yearly. Axle correction factors are also calculated. ATRs are also used to develop growth factors for AADT estimates created from short-term counts not being counted in the current year of the three-year cycle. In Massachusetts, seasonal adjustment factors are developed from the permanent inductive loop/piezo cable stations. The axle correction factors are developed from the TMG/HPMS required 300 vehicle classification stations (100/year on a 3 year cycle). The factors are developed and updated each year. They are entered into a MS Excel spreadsheet by group for seasonal adjustment factors and functional classification for axle correction (truck) factors, and then analyzed to develop the listed adjustment factors. In New Jersey, pattern factors (Seasonal Adjustment Factors) are computed by grouping continuous monitoring stations into broad functional class groups (i.e., rural interstate, other rural, urban interstate, other urban, and recreational). For each station, the monthly average weekday is compared to the AADT, as is done for the group as a whole. Stations at which three or more months deviate from the group average by more than 20 percent are rejected from the group and considered as recreational pattern. The stations in each group are then analyzed and it the variation exceeds 20 percent, the station is considered ungrouped. This process is iterated until the stations within each group conform to the group pattern. Axle Correction Factors are computed by grouping all available vehicle type classification data by functional classification. The sum of vehicles by type is divided by total vehicles to determine percentage of vehicles by type. By using axles per vehicle type, average axles per vehicle is determined, and when divided into 2, the Axle Correction Factors are determined. These are averaged for three years of classification data to provide a three-year moving average. The pattern factors (Seasonal Adjustment Factors) are updated annually. The Axle Correction Factors are updated annually based on a three-year moving average. 3Interview with Tom Schinkel, Virginia Department of Transportation for FHWA's Traffic Data Quality Workshop project, October 1, 2002. 4NYSDOT, Zone 3 Contractor Specifications, June 2003. 5California Department of Transportation (Caltrans), Guide for Staff to review traffic data, from Joe Avis, Chief, Traffic Data and Photolog Unit, Division of Traffic Operations. 7Information provided by Joe Avis, Caltrans.